Yaaba Funk have been an important part of the contemporary Afro scene in the UK since their formation in Brixton, London in 2006. The band have been playing their ‘21st Century Hi-Life’ around the world ever since. With two albums under their belt and a third due for release in 2018, the band is as accomplished in the studio as they are on stage. 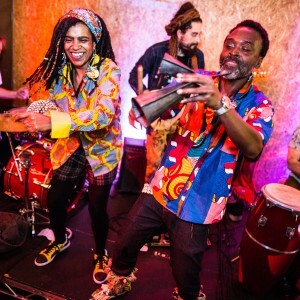 “(If you) imagine Fela Kuti’s legendary Shrine club relocated to South London you’re a long way to understanding the irresistible appeal of this energetic collective” (Womad website). 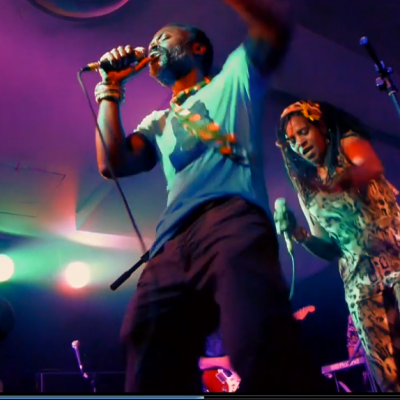 “The band mix Hi-Life, Afrobeat and Funk with the bass-heavy sounds that exemplify much of London music. Trying not to dance is like trying to eat gum without chewing” (Catch A Vibe website). Fronted by vocalists Richmond Kessie and Helen McDonald, Yaaba Funk bring hard-hitting Afro drums and percussion, tight horns and psychedelic guitars into the mix. Yaaba Funk have played Womad (UK), Sauti Za Busara (Zanzibar), Africa Oye and Liverpool International Music Festival (Liverpool), Bairro Intendente em festa (Lisbon), Shambala Festival (UK) and the London Jazz Festival, as well as many other venues and festivals in the UK and Europe, including support slots for Seun Kuti and Ebo Taylor. Yaaba Funk’s debut album “AFROBEAST” was released in May 2010 by Sterns Records. DJD and Richard Olatunde remixed tracks from the album which were released by Here and Now Recordings. “MY VOTE DEY COUNT” was released in April 2014, also by Sterns Music, with cover art by Abe Odedina. As well as digital and CD formats, a limited edition white vinyl LP was pressed. 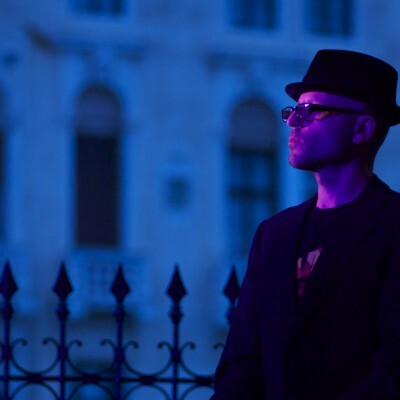 Mixed by Daz-I-Kue (Bugz In the Attic) the album features several notable guest musicians such as Nick Ramm and Jesse Hackett (keyboards), Robin Hopcraft (trumpet) and Idris Rahman and Jason Yarde (saxophones). French DJ magazine Starwax ran a remix competition of the track “James Brown” and the Renegades of Jazz and Ishfaq remixes were included on the CD version of the album. 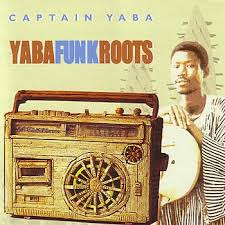 The name Yaaba Funk comes from an album called “Yaba Funk Roots”, the only album ever released outside of Africa by Captain Yaba, a musician from northern Ghana and exponent of the 2-string instrument called the koliko.